Last meeting we got the Ardupilot running in the glider and played glider football a bit, but were unable to quad drop before it got too dark. We will probably continue work with integrating the Ardupilot tomorrow, and if we get to a state of completion we can begin integrating the remaining electronics (camera, telemetry, long range receiver). Had a good meeting. Mostly we purchased several necessary components: long range telemetry and video systems, metal gear servos, and a new airframe. Next “official” meeting is this Wednesday at 7pm, 2 days from now. This past Wednesday, Harold, Nick, and I got together at the space since all the parts we ordered arrived and we all wanted to get together and see them. They are quite impressive. We did not do much besides look at the parts, unless something happened after I left. 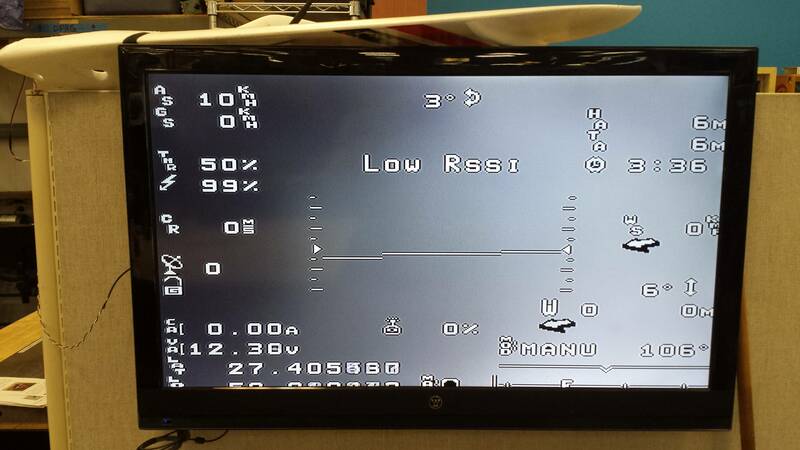 We did discuss maybe getting a long-range RC receiver rather than relying on telemetry-based control. However, since that is a drop-in replacement for a normal RC receiver, it doesn’t block us from building the aircraft with a normal receiver. Main goal of this coming meeting will probably be electronics integration / assembling the new airframe. Hopefully the internal deck will be ready by Wednesday. I think it’s time to schedule a weekend workday, so we can drive this thing a whole lot further. I think we are realistically at a point now that 2 or 3 weekend workdays will get us launch-ready; there aren’t any things I can think of that would force us to stall while waiting for something to ship or to be designed or built besides the aircraft itself. I had a short chat with @bgangwere after the Haas class on Sunday as he had made a comment about his autoclave project not having gone anywhere for 6 months. I want to put out there the idea of making the autoclave a follow-on RC/Aero project once we succeed with the HAB. I think a composites manufacturing capability is in our interest and would not mind helping to make that a thing. Meeting this Wednesday at 7pm as is tradition. Built-in hot wire cutter and video antenna mount. Sweet. Now to 3d-print tomorrow. Hope the dimensions on everything work out. Edit: To clarify, the thing that wasn’t done was the antenna mount; I had it mapped out but didn’t have the dimensions of the mount. Took a pair of calipers to the antenna this evening and got the size the snaps would need to be to make it work. I’m very impressed with that complex model. The new plane you guys got loos a lot more sturdy. Still on the to-do list is to finish the telemetry antennas, I am going to use RG58 coax and dipoles in each wingtip. 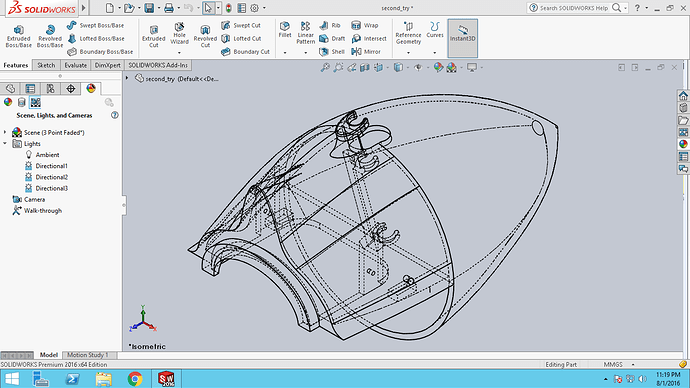 I will also 3d print the awesome tail cone/wire cutter design that Chesley created. I went ahead and ordered a 1.3Ghz video transmitter and receiver that we can use, in case we aren’t able to borrow one. The last major hurdle is the antenna tracker and ground station. We need to get the tracker working, and come up with ground antennas for the video, telemetry, and possible UHF control link. Meeting on Wednesday at 7pm. Harold, were you able to print the tail? I want to see how that thing turns out. I will probably be late to some degree. Edit: 30min or so away. Meeting once again Wednesday at 7pm. 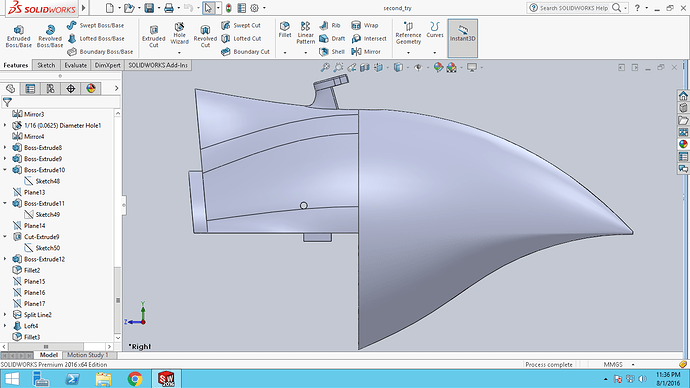 I finished the tailcone redesign last night; the tailcone now comes in 2 pieces you assemble. Note: #6, 1/2in self tapping screw I found on google is what I designed the screw holes to. I’ve lost track of what needs to be done. I believe it’s pretty much all electronics integration, antenna tracker, then testing, testing, testing. I don’t know if we’ve done anything at all about integrating a GoPro or trying to figure out how we’d point one at the moon. I am printing the tail cone parts tonight, but they still require a ton of support material. We’ll see how they turn out, print time is about 7 hours. I recently bought 1.3Ghz video receiver we can use, so we can test the video transmitter this week. I also have a pair of 915Mhz ceramic patch antennas on order from Mouser, they hopefully will arrive by Wednesday. They are directional (when mounted on a ground plane), so mounting them on the bottom of the wings will give us the maximum amount of RF directed downwards, wasting as little as possible up into space. They’re also circular polarized, so orientation doesn’t matter, and we can use a high gain helical on the ground side. Reminder: meeting tomorrow at 7pm. Should be more system integration work. Got the eyelets for hanging the aircraft from the balloon installed last time and did some work on the cutter bolts. Harold did some more things … I think with getting the antenna tracker running and getting some more electronics integration stuff done; I’ve forgotten, he left my area of expertise a while ago. I am considering not coming tonight and visiting my grandmother in the hospital instead. Haven’t made up my mind. I can’t make it tonight, I have plans with the wife. I will be out of town next week. If y’all want to organize a meeting without me, that’s fine. Main word is there’s just busy work and testing until we’re ready to fly. Probably should spend a Saturday on it. Haven’t planned one yet. Alright. I will be there tomorrow at 7pm, as is tradition. Goal is to get things that should be working together to work together, i.e. plug everything in and make anything that hasn’t already been made, which should be … probably just the telemetry antennas. I expect to plan a Sunday work day tomorrow as well, since that’s what we really need. I will be there again this Wednesday at 7. Last week I learned Harold had a new job that would probably make it a lot harder for him to participate. I will probably need to take more personal action to get this thing done. Good times. Hmm. I will either come fairly late (I’m late at work today) or not at all since I didn’t sleep last night. I’m leaning towards not at all, because I think I’ll fall asleep at the space if I don’t skip it. 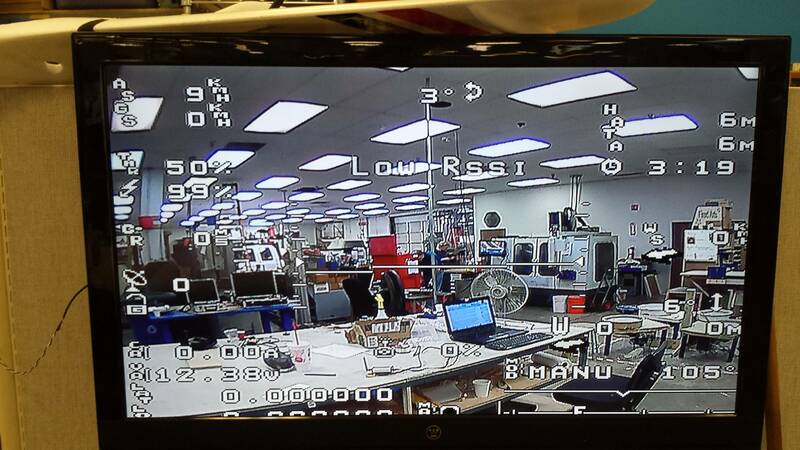 There’s been some chatter on the Aero / RC Google Hangout about restarting the HAB project. I will let Daniel know I’m bumping the talk thread. In addition, while weekly meetings are nice, there is almost never much time to actually get work done during them. This is why it’s two weekend workdays needed. The same amount of work might take us 3 months if we do it for an hour every other week, and in that time we will change enough things that we will need another 3 months to finish. So weekend workdays. Has to be. Finally, we are discussing having a meeting on the weekend of the 25th-26th. If you are interested in participating, please reply either in this thread, in the Aero Google Hangout, or on the new FB page letting us know what time will work for you. Ok I’m here at the space and I’m planning on getting something done while I’m here. Huh. Looking at that I’m liable to say we actually got things done. Worst case on the Telemetry Tx is we can use the antennas it came with. Harold didn’t like them since they’re garbage on both weight and aerodynamics, but I’m at a point where I don’t care anymore and just want it to fly. Long range Tx is still an important consideration. Iirc after looking at the Dragon Link (?) thing it was decided LR Rx decisions could be postponed until after everything else was done, since integration was basically that it’s a drop-in replacement for our current setup. I think once those two things are handled we can move on to full systems tests of power draw and range. Once power draw is known, we decide the battery. THEN we can finalize component placement since CG can be known for sure. Once all that is done, the aircraft is basically complete. We would then move on to testing range more fully and generally building experience so that we’re ready in the event we need to manually fly it in. Then prepare for launch and launch. The fastest way forward is probably to use the crappy antennas we have, buy whatever long range system with committee money, integrate, test, and fly. It’s not elegant, but I’m going to prioritize completion over elegance here.